The Bullet has inspired generations of Indians and expats to attempt customisation. 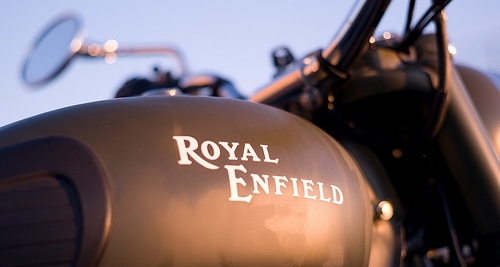 The brand's macho, rugged image and its association with the armed forces are legendary. Many owners including yours truly have had a history of enduring an exasperating wait for an army matte green paint job for their RE bikes. It is an impressive effort by the designers at the Royal Enfield factory in Tiruvottiyur, near Chennai to have thought of a model inspired by war – a theme with a lot of relevance for this bike. The matte-finish sand color paint job, the conventional stickers and rubber pads on the tank and the spring saddle seats identical to the older Classics provides the epic touch to the new model. However it is equally challenging to maintain the matte finish which is why you are here !! As matte finish color is new to many of us, we'll start with some general knowledge about matte finish color (since many of us wonder what matte finish is all about). Matte Paint is a unique automotive paint finish isn't unique to motorcycles. In fact, matte paint has been used in other industrial environments for years. Truth is, matte paint has been around quite some time before luxury brands caught whiff of the revolutionary craze that would change the auto industry forever. So why does matte paint look so flat? The trickery that matte paint plays on our eyes isn't one of scientific wonder. In fact, it’s quite simple. Your typical glossy looking motorcycle is basically made up of a base layer (primer), a pigment layer, and a reflective clear coat. Matte motorcycles are basically that same motorcycle with a very finely dinged up clear coat. What clear coat does is add depth and “significance” to your motorcycle's ain't, but when it comes to matte, it dulls it down. What you see on matte paint that you don’t on a “normal” motorcycle is the dimples and divots in the clear coat that eliminate light’s ability to reflect directly off the motorcycle and therefore the surface appears flat with a sheen rather than a shine. Because there is no crisp, consistent clear coat layer on matte motorcycles, you don’t see your reflections when you glance over the motorcycle. Do not use polish or wax on your matte paint. Polishing, an abrasive process, is meant to smooth out the surface and level off imperfections. Problem is, matte paint appears flat because of imperfections in the clear coat layer as discussed above. When you polish, you’re effectively diminishing your matte motorcycle's ability to retain light. Similarly, waxing your motorcycle' with any sort of paste or carnauba will fill those same imperfections, leveling the surface once more. Think about waxing over a tiny scratch on a “regular” motorcycle... when you wax over it, it will become less visible because light reflects more easily off of the less-imperfect surface. There you have it. Never use any mechanical or automated means of cleaning your matte paint. Basically it boils down to NEVER buffing your matte paint, and NEVER taking it to an automatic motorcycle wash. Any sort of high-speed (buffer) or repetitive motion (twirling brushes, dragging noodles, etc.) will cause harm to the matte finish. Always wash by hand with a pH balanced matte specific car wash soap. Always remove insect remains, tar, sap, oil, overspray, bird poop, etc., etc., etc. from your paint immediately. This one’s super simple, but given their next claim, you’d think it’d be tough to do, but you’ll soon see it’s not as hard as it looks. This last point is important, you should preferably use warm water, sealants and a micro fiber to clean. Well let’s start with microfibers. Microfiber towels are the absolutely safest towel to use on the market due to their absorbant, plush, and lint free characteristics (read more on microfiber). They don’t drag contaminants across the surface like a chamois or cotton towel, they don’t leave streaks, and their water retention is nothing short of admirable. That said, they can be damaging if there is an exposed seam coming in contact with the paint, or in the event that the towel is soiled – yes – any towel will do damage. Next, applying any type of wax or sealant does pose the risk of damaging paint. Applying just about anything with a terry or microfiber applicator to a dry surface will microscopically harm your paint and cause minor surface scratches. Matte Rule #4 is arguably the single most important rule for matte motorcycle owners. I cannot stress enough the importance of protecting your paint, as that is the only way to preserve it’s factory no-shine look. Truth is, everything covered in Rule #3 becomes a whole lot easier when you protect your paint. Protect your matte paint regularly with a no-shine, no wax, non-filling matte paint sealant specifically designed for the uniqueness of your paint. Now that you know how to take care of the matte finish of your Royal Enfield Desert storm, you should also be aware of few matte finish myths that have been circulating for quite some time. To know more click here. Most people hate the look. Love the paint paint job on desert storm. Awesome article man!! I wish I had read this article before coz the showroom guys in Pune have spoiled the matte look by applying some sort of wax.. I'd advise all the bulleteers reading this article to follow the tips otherwise you'll lose your matte look of your motorcycle. I recently bought royal enfield desert storm and was wondering how to clean rather maintain matte color as this type of color is new to me.But thanks to you guys! where can I buy no-shine, no wax, non-filling matte paint sealant. I live in Kolkata.